We then apply the system to generate genetically encoded synthetic histone acetylation marks to directly test the function of this posttranslational modification in chromatin, one position at a time. This approach highlights the potential of the methodology to perform experiments with biochemical precision in living cells that could otherwise only be achieved in vitro. In vitro experiments can provide a clear link between molecular cause and effect, but are abstracted from the appreciable complexity of the cellular environment. In contrast, in vivo experiments typically provide a wealth of correlative information about changes of chromatin state in a native context, but it is commonly impossible to infer direct causation from these experiments. 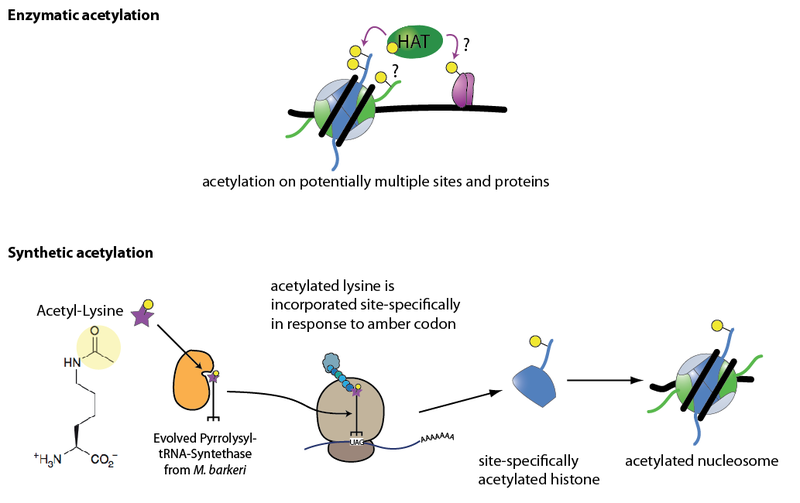 For example, all histone acetyl transferases (HATs) are known to acetylate a range of sites and substrates, including non-histone proteins, thus genetic knockout or enzymatic inhibition of HATs does not directly and exclusively test the function of histone acetylation. Employing a synthetic route to modulate cognate posttranslational modifications has the power to show direct causality between the modifications and their downstream effects, abstracted from the complexity of enzymes that set and erase the modifications. We believe that in the future such approaches to synthetic epigenetics will be very powerful for defining the function of posttranslational modifications, in particular the complex modification code present on histones.